Peak flavor, aged to perfection—your favorite whiskey brand gets a personalized spin. More than just a handsome homage to a whiskey-loving couple, this miniature oak barrel ages spirits to peak flavor, just like its full-sized siblings found in professional distilleries. Its petite proportions accelerate the aging process, meaning that the recipient's choice of liquor will hit its prime up to ten times faster. Oak is beloved of distillers because it imparts flavor to spirits through three main compounds: Lignin, which adds vanillin for vanilla and marzipan-like flavors, lactones, which give rise to buttery, coconut notes, and tannins, which add astringent, spicy flavors. Before first use, make sure to cure the barrel for 3-5 days, as mentioned in the included instructions. Turn the barrel and taste the contents weekly, and when they reach their ideal oakiness, enjoy a glass straight from the tap. Handmade by coopers in Manassas, Virginia. Ages 21+. Click here to learn how to use your Whiskey Barrel. Before first use, make sure to cure the barrel for 3-5 days, as mentioned in the instructions. Clean with damp cloth; use included Swish Barrel Cleaning Kit periodically as instructed. When not aging liquor, use sterilization tablets as instructed. Take care when using cleaning tablets - Use Only As Directed - Harmful if swallowed. I ordered one of these for each of my son-in-laws and they loved them! Perfect gift for any hard-to-buy-for man. My husband is excited to experiment with aging his own whiskey and loved the customization! Very nice kit and instructions! I bought the smaller size as a wedding gift for a whiskey-loving friend! I love that I was able to customize the label to have the wedding year, location, and their names. 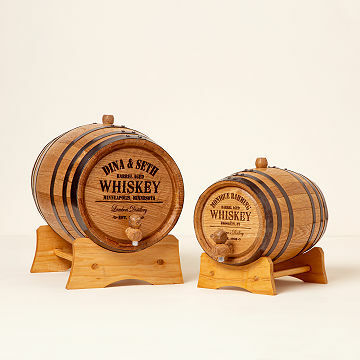 I don't know how well it works as a device for making/aging whiskey, but it will be a cute gift regardless. Giving a 4/5 only because I haven't used the product and so can't attest to whether it functions well or not. Husband plans to make his own whiskey and rum with the spices and directions provided. He was very impressed with this gift. A unique gift that will be sure to please! I love the authentic wood and metal that really gives the barrel sturdiness. Being able to customize it really makes it one of a kind. My fiancÃ© was in complete shock and surprise because it's a gift he never imagined receiving and he loved it!! Cool product, but the whiskey essence liquids leaked and were all half empty by the time I got them! The personalized whiskey barrel is a great, elegant gift for those who appreciate a nice, smooth glass of scotch every once in a while. It is functional yet decorative for when the barrel is not in use. The option to personalize such an elegantly wooden conversation-piece gives the gift an extra touch of class. Great hand crafted gift to help memories last! The quality of this product is fantastic. I can't wait to see it in production! Fun product that is well made and functional. I bought this as a Christmas gift for my parents, the quality was excellent and they were really exited by the idea of creating their own type of whiskey. I can't wait to taste what they come up with.